Converting a stock Darnell air system to a compressed air system. 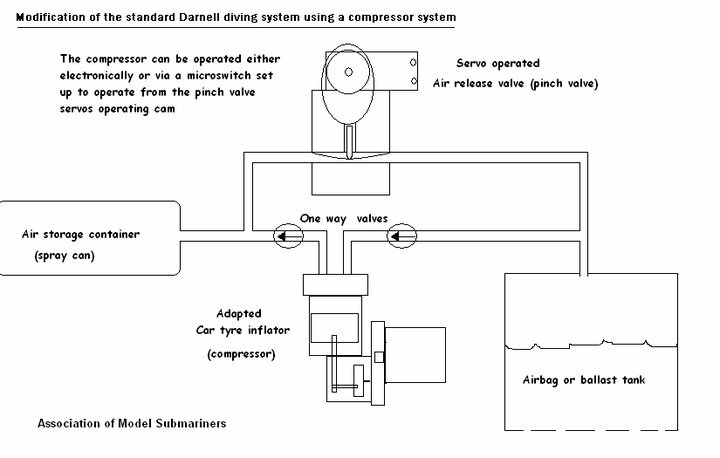 I thought that this diagram may come in useful for those wishing to convert a stock Darnell air system to one using the motor from an electric tyre compressor. Re: Converting a stock Darnell air system to a compressed air system. looking at this I now know where mine is wrong!!! What stops the compressor filling up with water sir,?????? The water is on the outside...in theory. I can see that if you have a bag inside tank,but if you dont very iffy,another litle point worth thinking about these car air pumps have no piston rings and leak pressure past the piston,this excess pressure ends up inside the boat,unless you vent the boat when on the surface this can become a very serious problem. I have 2 x stern air ballast and 2 Bow ballast. Do all the bags have to be of equal volume? Common sense says yes, but I have 3 the same volume and twice the volume. The system you are describing sounds very complicated. You may be better off starting simple with a single large bag (centred around the centre of bouyancy - the periscope typically), if you possibly can. I think that the original Darnell was like this. You can incorporate the other tanks as trim tanks as a separate system, but later on. Many years back when this conversion was first thought of, people had all sorts of problems using multiple air bags. Getting them to fill and empty together was virtually impossible, and getting your boat to submerge and surface on a level plane was a real pain in the proverbial. Going back to a single, centrally mounted bag makes life a whole lot easier. Bernie Wood and Jim Ward both tried to get a boat to work properly using two air bags, and both never really made it work properly. Bernie (at one time) did modify his Type V11c to use two pumps with their own air bags, each bag being individually controlled by it's own pump and switch...that worked to a point, but finding somewhere to store the extra air needed proved a problem, so the idea was discarded. If I were you Peter, I'd use the compressor system with a single, centrally mounted air bag...I think you'll find that will work very well, and will be much easier to set up. ok can do that. So how do I work out the displacement so that I get a big enough air bag? every 1KG in wieght,will take 1LTR of air to support it. I forget now what sizes those bags come in, I used to get them from SHG Marine, but whether they are still in operation I don't know. grrrr this is doing my head in. first found that the one way air valve had failed. two can get pressure to 20 psi but when the microswitch activates i dont have enough air to fill the bag!!! plus ordered simply subs from trapplett 2 weeks ago but no show even though they say theyve despatched it!! You're not having much luck with that boat, are you Pete? I suggest a word with Steve Juden or Paul Cook may well pay dividends, both of those two are well known for their expertise with compressor systems. Regarding the book, Traplet are equally well known for taking ages to dispatch stuff...two weeks is nothing! Give them a call, and keep pestering them!